The dsp.DynamicFilterVisualizer object displays the magnitude response of time-varying digital filters or time-varying filter coefficients. The input to this object can be a filter coefficients vector or a filter System object™. dfv = dsp.DynamicFilterVisualizer returns a dynamic filter visualizer object, dfv, that displays the magnitude response of digital filters or filter coefficients. dfv = dsp.DynamicFilterVisualizer(nfft) returns a dynamic filter visualizer with the FFTLength property set to nfft. dfv = dsp.DynamicFilterVisualizer(nfft,Fs) returns a dynamic filter visualizer with the FFTLength property set to nfft and the SampleRate property set to Fs. 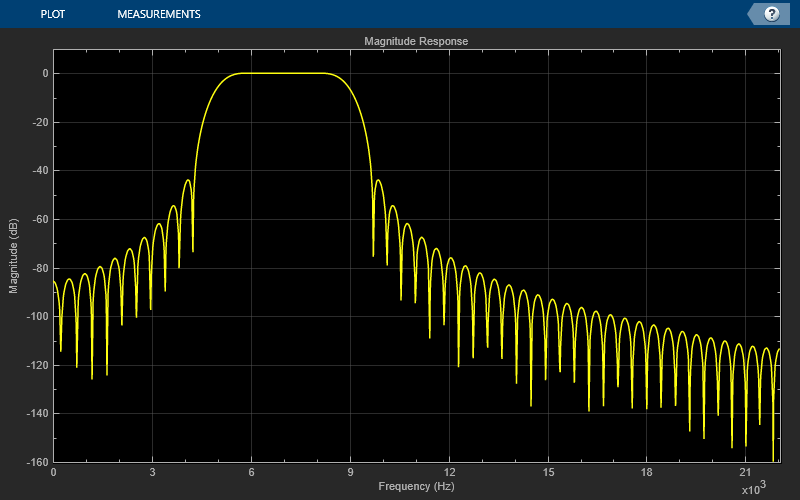 dfv = dsp.DynamicFilterVisualizer(nfft,Fs,range) returns a dynamic filter visualizer with the FFTLength property set to nfft, the SampleRate property set to Fs, and the FrequencyRange property set to range. dfv = dsp.DynamicFilterVisualizer(Name,Value) returns a dynamic filter visualizer with each specified property set to the specified value. You can specify name-value pair arguments in any order. FFT length that the dynamic filter visualizer uses to compute spectral estimates, specified as a positive integer. Sampling rate of the input signal, specified as a real positive scalar in Hz. Range of the frequency axis, specified as a two-element numeric vector that is monotonically increasing and of the form [fmin, fmax]. The upper limit must be less than or equal to Fs/2, where Fs is the value specified in SampleRate. X-axis scale, specified as either 'Linear' or 'Log'. Caption to display on the Dynamic Filter Visualizer window, specified as a character vector or a string scalar. Display title, specified as a character vector or a string scalar. Y-axis limits, specified as a two-element numeric vector with the second element greater than the first element and of the form [ymin, ymax]. When this property is set to false, no legend is displayed. When this property is set to true, a legend with automatic string labels for each input filter is displayed. Set this property to a cell array of character vectors to label the input filters in the legend. The default is an empty cell array. When this property is set to an empty cell array, the filters are named by default names, such as Filter 1, Filter 2, and so on. Upper limit spectral mask, specified as a two-column matrix. The first column represents the frequency values (Hz), and the second column represents the magnitude spectrum of the upper limit mask. Lower limit spectral mask, specified as a two-column matrix. 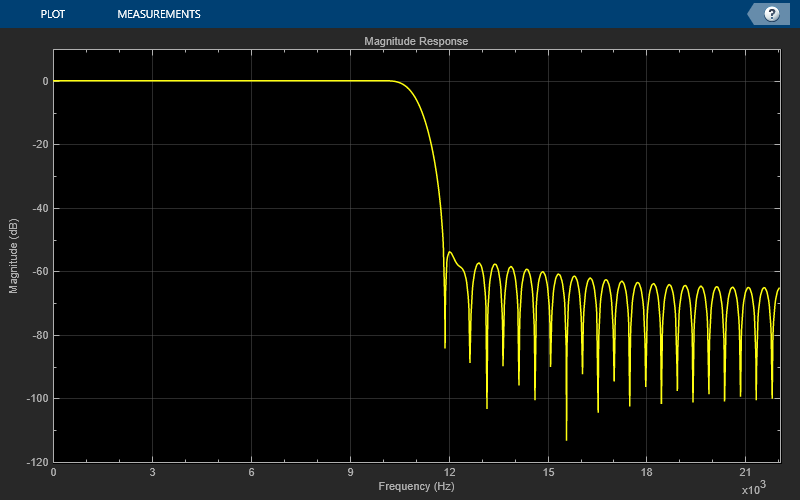 The first column represents the frequency values (Hz), and the second column represents the magnitude spectrum of the lower limit mask. Scope window position in pixels, specified as a four-element double vector of the form [left bottom width height]. The default value of this property is dependent on the screen resolution, and is such that the window is positioned in the center of the screen, with a width and height of 410 and 300 pixels, respectively. dfv(filt) displays the time-varying magnitude response of the object filter, filt, in the Dynamic Filter Visualizer figure, as long as filt has a valid freqz() implementation. dfv(B,A) displays the magnitude response for the digital filters with numerator and denominator polynomial coefficients stored in B1 and A1, B2 and A2, ..., and BN and AN, respectively. Input filter System object with a valid freqz() implementation.